PC Versions is Finally Coming! Grand Theft Auto (GTA) 5 for PC seems finally will be releasing on 14 April 2015. It has been already postponed, originally the release was planned on 27 January 2015. The smash hit game went down in history and the most expensive game ever created, coming in at around a $265 million just to create. 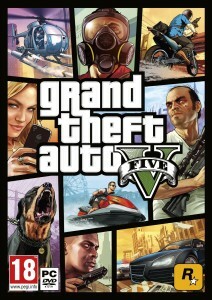 GTA 5 initially released on old generation platforms, Playstation 3 and Xbox 360 on September 2013. It then released on Playstation 4 and Xbox One on November 2014. Grand Theft Auto 5 has done extremely well. It is by far the best selling title in the history of video games. With sales of GTA 5 still high for PS4 and Xbox One, in fact, it still constantly hits the top charts both in the US and in Europe, and the upcoming release for PC will add even more sales to already astronomical volumes that have been higher that $1 billion in gross sales during the 18 months while the game exists. That’s no easy task but thanks to the extreme quality of GTA V and the effort that Rockstar Games put into creating such an amazing gaming experience, Rockstar has made it seem effortless. The single player campaign will drop the player into the shoes of three career criminals, Michael, Franklin, and Trevor as they rip through Los Santos and Blaine County causing chaos and creating quite the lengthy rap sheet. Players can also look forward to GTA Online, the online component of the game that allows players to team up with their friends and do as they please throughout Los Santos and Blaine County, which is an amazing experience that true GTA fans won’t want to miss. Although GTA 5 PC will be available on Steam, the boxed version of the game will not be compatible with Steam, and game keys scanned from the boxed versions will not be possible to use for activating on digital platforms. This was probably done intentionally by the publisher for discouraging trade of boxed version activation keys. Boxed version is available for pre-orders from wholesale distributors.